Short answer: No. It may even slow disease progression. Longer answer: As suggested in my discussion here, dopamine is a bit of a strange molecule to serve as one of the key neurotransmitters, because it is rather reactive, and can generate oxidative stress. So, unsurprisingly, dopamine can appear to be “toxic” in the laboratory setting. Levodopa is very chemically similar to dopamine and has similar properties, and generates dopamine in the brain … that’s how it works. Although both levodopa and dopamine are present in healthy brains, and thus are not normally toxic, the situation is clearly different in Parkinson’s patients, where neurons are already degenerating, and levodopa therapy adds “extra” levodopa and dopamine for many years. So on this basis, there has been some concern about levodopa being toxic. The resolution of this question has profound implications for Parkinson’s therapy. Patients certainly don’t want to take a drug that is “toxic”. But even among experts in the disease, who have a more nuanced understanding of the issue, there have been lingering concerns that levodopa — while it clearly reduces Parkinson’s symptoms — might actually accelerate the course of the disease. This concern, along with the undeniable dyskinesia side effects of levodopa, has led many clinicians to withhold levodopa as long as possible, using dopamine agonists as first-line therapy, especially for younger patients. Patient fear of levodopa has also contributed to widespread acceptance of “levodopa-sparing” therapeutic strategies: start using it as late as possible, and use as little as possible when you do start using it. The issue of dyskinesias is more complicated and deserves a separate discussion, but the question of whether levodopa accelerates the course of the disease has been answered rather definitively “no”, eliminating this concern. Or at least it should, but old habits die hard. The key scientific evidence comes from a clinical study called the ELLDOPA trial (Earlier versus Later Levodopa). The trial design was fairly simple: randomly assign patients to placebo or 3 doses of levodopa (administered as sinemet): 150, 300, or 600 mg total levodopa per day. (The study was “double blind”, meaning that neither the patients nor the clinicians knew who was assigned to which group.) Patients’ symptoms were tracked at the beginning of the trial and throughout the 40 week course of the trial. Not surprisingly, patients assigned to 600 mg levodopa per day did the best, followed by the patients with 300 and 150 mg of levodopa, who still did significantly better, on average, than patients who took the placebo. But we knew that already: levodopa is quite effective at reducing many Parkinson’s symptoms. 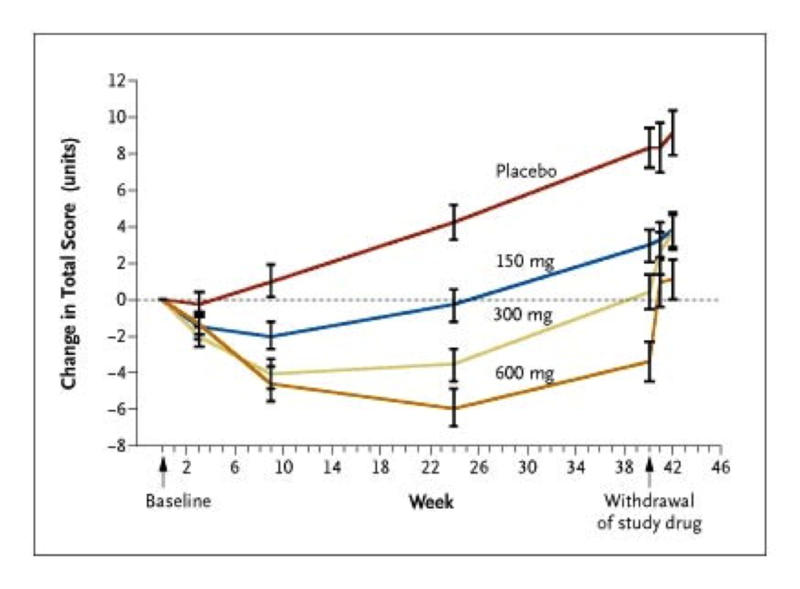 The key to the study came after week 40, when all participants stopped taking any levodopa (or placebo) for a two week period. One possible outcome, and the one I would have expected, is that all of the patients who had been taking levodopa would have rapidly worsening symptoms in the two weeks with no drug, and would wind up looking a lot like the placebo group, who hadn’t been taking any drug all along. If levodopa accelerated the course of the disease, then patients on the highest dose should actually wind up worse than the placebo group. Results of the ELLDOPA study. The actual results: just the opposite. People in the placebo group wound up, on average about 8 points worse on the UPDRS scale (measuring Parkinson’s symptoms) at the end of the study, due to the disease progressing. Patients randomly assigned to the 300 or 600 mg levodopa per day, by contrast, wound up with similar scores to when the clinical trial started (again, on average), even after they had stopped taking levodopa for two weeks. Even the investigators running the clinical trial were stunned by this result. A small fraction of the participants in the clinical trial were asked to stay off levodopa even longer, an additional two weeks, and those patients also showed little additional deterioration with respect to their symptoms over that time frame. The optimistic interpretation of these results (and my own interpretation) is that levodopa not only doesn’t accelerate disease progression, it is actually slows down disease progression. So why isn’t levodopa commonly referred to as neuroprotective or a “disease modifying drug”? There are 2 major reasons, each of them a little complicated, and in my view, of dubious validity. But the burden of proof for claiming that a drug slows down disease progression is very high, so it is worthwhile to examine these caveats. The first has to do with a poorly understood attribute of levodopa, the so-called long-duration effect. As discussed here, levodopa is rapidly cleared from the blood, and symptoms can quickly reemerge as the drug concentration drops. By the end of one day without the drug, there is very little left in the blood, but somehow the drug still appears to have some effect, which gradually diminishes over several days. The people who designed the ELLDOPA trial knew this, and that’s why they built in a two-week period at the end when all patients would stop taking the drug. Based on what was known about the long-duration effect, that should have been plenty of time for levodopa to stop having a beneficial effect on Parkinson’s symptoms. And yet the patients who had been taking levodopa in the study showed only modest increase in their symptoms after two weeks off the drug. Rather than accepting that levodopa slows progression of the disease, some doctors have instead proposed that the long-duration effect may last even longer than previously thought, or that there is a super-long-duration effect that extends for many weeks, after which symptoms would finally return in full force. One suspects that if the study had kept patients off levodopa for 3 months, and there was still benefit, someone would postulate a super-mega-long-duration effect. How long would the duration of benefit, after withdrawing the drug, need to be in order to convince people that it really is slowing disease progression? More than likely, we’ll never know. At some point it becomes unethical to ask the clinical trial participants to stay off the drug for long periods of time, when it clearly provides important symptomatic benefit, if nothing else. The physiological basis of the long-duration effect remains mysterious. A second major objection to concluding that levodopa slows disease progression is that other studies have allegedly shown just the opposite. But it’s important to understand the actual data behind this assertion, which is based on neuroimaging methods that measure the amount of the dopamine transporter in the brain. The idea is that this signal will decrease as the disease progresses and dopamine-producing neurons are destroyed. This type of approach had been used in previous clinical studies comparing levodopa with dopamine agonists (such as CALM-PD), with results that did not look favorable to levodopa. But as the Fox Foundation ceaselessly points out, there is no well-validated biomarker for Parkinson’s; that is, there is no blood test or imaging method or anything else that can yet be used to monitor disease progression, other than measuring the symptoms of the disease. The imaging methods certainly measure something, but not enough is known about how it relates to disease progression, or whether it is directly affected by different drugs independent of disease progression. The ELLDOPA study actually had an imaging component as well, and they too found a greater decrease in dopamine transporter levels among the patients who took levodopa vs. those who didn’t. This would be alarming if the patients who took levodopa also fared worse in terms of clinical evaluation of their symptoms, but as discussed above, quite the opposite happened. In my view, this casts doubt on the use of neuroimaging data to quantify disease progression, pending further research. On the other hand, while the UPDRS scale used to quantify Parkinson’s symptoms is certainly not perfect, it has been extensively validated and used in many clinical trials. Bottom line: Levodopa does not accelerate disease progression, and may actually slow disease progression, although this remains controversial.